EDINBURG — After three standout seasons at San Diego State University, Kyle Adams decided he was finished with college life. He had stopped going to class, and he was fed up with NCAA rules limiting his training schedule. Adams said he was “lucky” to be invited to a combine in Las Vegas, where he put his ability on display in front of the Houston Dynamo’s coaches. Not long after, he was signed to RGV FC. 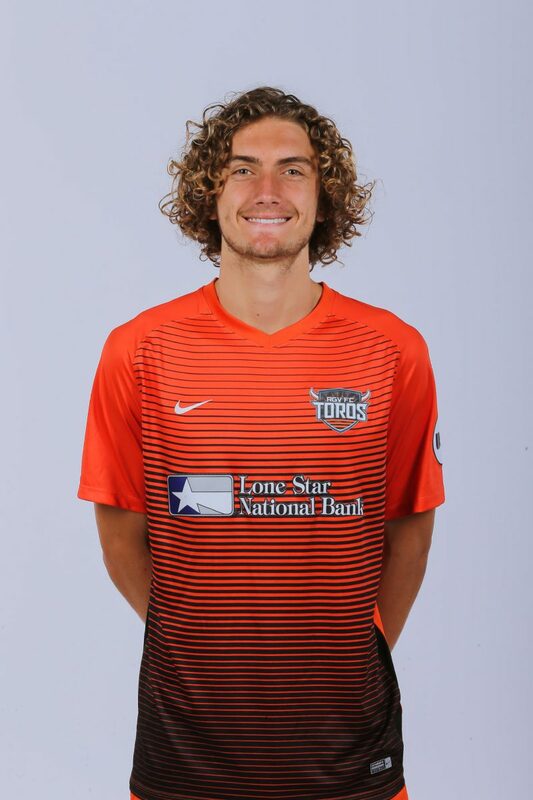 The 21-year-old from New Zealand quickly found a home with the Toros, starting all but one of RGV FC’s games as part of a back line that has maintained three clean sheets in its past four matches. RGV will be looking to keep that streak going in a match against Swope Park Rangers at 7:30 p.m. Saturday at H-E-B Park in Edinburg. Adams said he started playing soccer at age 4. His father was a coach and his older brother played, so soccer was the only sport he ever really attempted. Though New Zealand offers only limited opportunities for professional play, Adams was able to enroll in a residential academy designed to feed players to U.S. colleges. The academy helped him earn a spot at San Diego State, which he said was an easy transition because his brother lived in the area and the laid-back culture was similar to what he had grown used to in New Zealand. “Over here, the game is growing, so I saw it as an opportunity to get into a growing market,” Adams said. After leaving SDSU, Adams considered moving to Europe to play, and he also went through a training stint with Club Tijuana in Liga MX. But, given that he is married and “looking at starting a family here in the near future,” Adams said his best option was staying in the U.S.
With RGV FC, he has ranked as one of the team’s best in both duels (58.6 percent success rate) and aerial duels (67.6 percent). Typically a center back, Adams has recently been trying his hand at left back. Echeverry said the Dynamo were intrigued to see how the naturally left-footed Adams would fit at the outside position, which requires more running and one-on-one marking. Echeverry said the change requires Adams to play and read the game from different angles, and Adams said he’s had to be more focused on attacking from the wide position. Fellow RGV FC defender Conor Donovan said he’s been impressed with how Adams has played through the transition. RGV FC has posted three straight shutouts when Donovan, Adams, Omar Ontiveros and Manny Padilla start in the back. Prior to the beginning of that stretch, the Toros had conceded 11 goals in five matches. Donovan and Adams both attributed the improvement to chemistry and comfort within the group, while Echeverry also praised the Toros’ midfielders and keeper Nico Corti. Echeverry said the Toros shifted their focus to be less worried about scoring and more resolute in defending following their early struggles. In June, Adams will donate $5 for every game he plays — plus an additional $5 for each goal or assist — to Playing for Pride, an organization that supports LGBTQ rights and equality through soccer. Adams said he heard about the initiative through a Twitter post from his friend Jon Bakero, who plays for the Chicago Fire in the MLS. Adams added that he is looking to expand the growing base of participating players through his own social media.